Not sure what your plans are this Valentine’s Day? Don’t let Cupid stress you out. Check out everything that Bryan College Station has to offer! In Downtown Bryan you can be sure to find lots of flavorsome options but make reservations and mark your calendars soon if you want to enjoy a romantic dinner in one of the many local restaurants! You can enjoy anything from a romantic evening of food and wine at Madden’s Casual Gourmet to a perfect slice of pizza from RX Pizza. After a good meal, relax and watch a movie at the Queen Theatre! The Queen Theatre will be playing Sabrina at 1:30PM and 7:00PM on February 14th. Celebrating Valentine’s Day later in the week? Check out the whole schedule! They say that the best way to someone’s heart is through chocolate. Well, if you haven’t had chocolate from The Chocolate Gallery in the heart of Downtown Bryan then now is the perfect time to do so! Pre-order your Valentine’s Day chocolate online! Go ahead and make a mess out of a delicious meal at MESS Waffles, Etc. in Century Square. What started out as a restaurant on wheels is now a favorite to many in Bryan College Station. If chicken and waffles isn’t your thing, don’t worry. MESS offers other interesting meals that will make anyone’s heart happy! If what you’re looking for is something a bit more romantic then head on over to Porters or Poppy. Both are located in Century Square and don’t forget to make a reservation! We get it, shopping is fun. If you want to incorporate shopping into your Valentine’s Day plans or maybe shop for a special someone, Century Square is home to several stylish boutiques. If shopping isn’t your thing, catch a movie at Star Cinema Grill or enjoy a massage for one (or two) at Galleria Day Spa! If having dinner under the stars in a forest sounds like your ideal way to spend Valentine’s Day, then dinner at Ronin Farm and Restaurant is the place to be. They are hosting St. Valentine’s Day in the Forest and will serve a five course meal. Be sure to bring an appetite and wear closed toed shoes! Tickets can be purchased online. Wolf Pen Creek Park will have its annual Trail of Lights. Enjoy a romantic walk through a path filled with lots of twinkly lights any day between February 1st-28th from 6:00-10:00PM. If walking through a pathway of lights isn’t already romantic enough, head on over to Trail of Lights on February 14th for Date Night from 6:00-9:00PM to enjoy pretty lights, food trucks, and gift vendors. Admission is free! Treat your sweetie to Messina Hof for the perfect Valentine’s Day! Your date begins with a glass of Texas Sparkling Wine as you stroll around the estate hearing the history of the winery. After your guide introduces you to growing, fermenting and producing their award-winning wines, you will taste 4 different varieties directly from the tanks and barrels in their romantic, candlelit Cellar Room. And finally, you will finish off the tour with a luscious handmade Papa Paulo Port Chocolate Truffle! If a staycation sounds like the perfect way to celebrate Valentine’s Day then you’re in luck because The Stella Hotel has several specials going on to help you make this Valentine’s Day a special one. Enjoy a Romantic Room Package complete with chocolate truffles and a bottle of Francois Montand Methode Traditionalle Brut Rose upon arrival. Head over to this link for availability, a promo code, and to make reservations. In addition to a romantic stay at The Stella, enjoy a Prix Fixe Menu for Two at Campfire on Thursday, February 14 from 5:30-10:00PM. If you’re wanting to keep the night going, head over to Valentine’s Day Nightcap at Hershel’s for the speciality Rosebud Cocktail and half priced select wine bottles. Want to see all of the other wonderful hotel options in Bryan College Station? Check them out here! 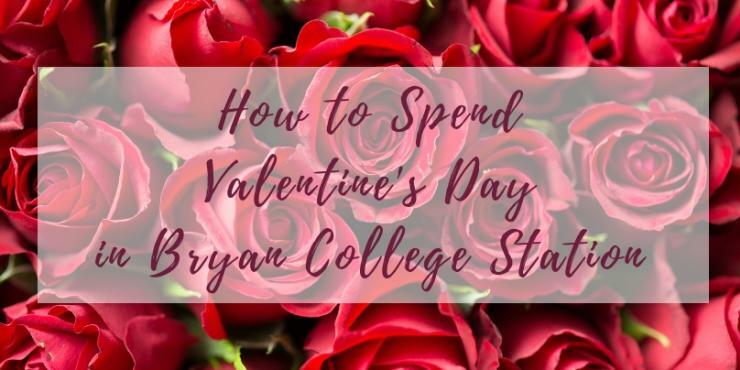 We hope you enjoy celebrating Valentine’s Day in Bryan College Station! If you have a favorite Valentine’s Day tradition, we would love to hear about it. Don’t forget to tag us in your Valentine’s Day celebrations @ExperienceBCS or use the hashtag #BCSTX!